Laundro Xpress is Miami’s Highest Quality Laundromat and Coin Luandry. 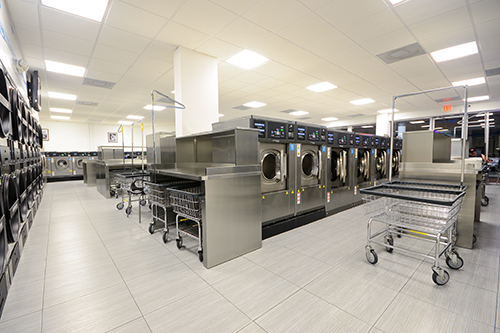 Our brand new facilities feature some of the nicest coin laundry equipment in all of South Florida. When you walk into Laundro Xpress you will find a clean, pleasant environment that is truly a pleasure to do laundry in. We have a plethora of coin laundry machines so you never have to wait and our extra-large family sized washers are perfect for your biggest wash loads so that you can be in and out and move on with your day in no time! We also have 3 jumbo sized flat screen televisions in both English and Spanish languages. Some other perks we offer our customers is Free Wi-Fi, power outlets to charge your devices, and plenty of parking right next to the Laundromat! – Drop off Dry Cleaning that is incredibly fast and the best part is at comes at no extra cost to you! – Same day Wash & Fold Services that takes approximately 4 minutes, 2 minutes for drop off and 2 minutes for pick-up! We use the highest quality name brand laundry products. We are open 7 days a week 15 hours a day!